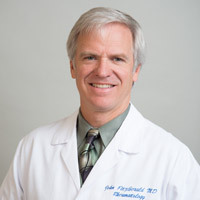 John D. FitzGerald, MD, PhD research focuses on gout. Dr. FitzGerald is studying the impact of gout on cholesterol and how that relationship impacts atherosclerosis. Dr. FitzGerald, working with the Ozcan lab, has a patent (pending) application that uses a lens-free polarized microscope to identify gout (monosodium urate – MSU) and pseudogout (calcium pyrophosphate– CPP) crystals. In addition to several reviews and editorials on gout, Dr. FitzGerald has been lead author for the American College of Rheumatology Gout Quality Improvement Measures and American College of Rheumatology Gout Guidelines. Dr. FitzGerald is also interested in Quality of Care and patient outcomes research. He has studied the impact of Rheumatology physician supply on patient care, hospital surgical volume on patient outcomes and patient quality of life after joint replacement surgery. Dr. FitzGerald also conducts policy research. Finally, Dr. FitzGerald has led national efforts to ensure quality of care for Musculoskeletal Ultrasound applications in Rheumatology. Dr. FitzGerald received his MD from Tufts University in 1993. He received PhD in Health Services from UCLA in 2005. He completed his medical residency in 1996 and fellowship in Rheumatology in 1999, both at UCLA. Dr. FitzGerald has been on faculty in the Division of Rheumatology since 1999. He is currently Interim Chief of the Division. Dr. FitzGerald sees patients 1 half day per week in Westwood and 2 half days per week in Santa Monica. Khanna D*, FitzGerald J*, Khanna P*, Singh M, Bae S, Neogi T, Pillinger M, Merril J, Lee S, Prakash S, Kaldas M, Gogia M, Perez-Ruiz F, Taylor W, Lioté F, Choi H, medicine/Rheumatology, Singh J, Dalbeth N, Kaplan S, Medicine, Niyyar V, Jones D, Yarows S, Roessler B, Kerr G, King C, Levy G, Furst D, Edwards L, Mandell B, Robbins M, Wenger N, Terkeltaub R. "2012 American College of Rheumatology Guidelines for Management of Gout Part I: Systematic Non-pharmacologic & Pharmacologic Therapy of Hyperuricemia." Khanna D*, Khanna P*, FitzGerald J*, Singh M, Bae S, Neogi T, Pillinger M, Merril J, Lee S, Prakash S, Kaldas M, Gogia M, Perez-Ruiz F, Taylor W, Lioté F, Choi H, medicine/Rheumatology, Singh J, Dalbeth N, Kaplan S, Medicine, Niyyar V, Jones D, Yarows S, Roessler B, Kerr G, King C, Levy G, Furst D, Edwards L, Mandell B, Robbins M, Wenger N, Terkeltaub R. "2012 American College of Rheumatology Guidelines for Management of Gout. Part II: Therapy and Anti-inflammatory Prophylaxis of Acute Gouty Arthritis" Arthritis Care & Research Vol. 64, No. 10, October 2012, 1447–1461 PMID:23024029 *Co-First Authors. Khanna PP, Gladue HS, Singh MK, FitzGerald JD, Bae S, Prakash S, Kaldas M, Gogia M, Berrocal V, Townsend W, Terkeltaub R, Khanna D. Treatment of acute gout: a systematic review. Semin Arthritis Rheum. 2014 Aug;44(1):31-8. doi: 10.1016/j.semarthrit.2014.02.003. Epub 2014 Feb 13. PubMed PMID: 24650777. Zhang Y, Lee SY, Zhang Y, Furst D, Fitzgerald J, Ozcan A. Wide-field imaging of birefringent synovial fluid crystals using lens-free polarized microscopy for gout diagnosis. Sci Rep. 2016 Jun 30;6:28793. PMID: 27356625; PMCID: PMC4928089. Newberry SJ, FitzGerald JD, Motala A, Booth M, Maglione MA, Han D, Tariq A, O'Hanlon CE, Shanman R, Dudley W, Shekelle PG. Diagnosis of Gout: A Systematic Review in Support of an American College of Physicians Clinical Practice Guideline. Ann Intern Med. 2017 Jan 3;166(1):27-36. doi: 10.7326/M16-0462. PubMed PMID: 27802505. Shekelle PG, Newberry SJ, FitzGerald JD, Motala A, O'Hanlon CE, Tariq A, Okunogbe A, Han D, Shanman R. Management of Gout: A Systematic Review in Support of an American College of Physicians Clinical Practice Guideline. Ann Intern Med. 2017 Jan 3;166(1):37-51. PubMed PMID: 27802478. Aung T*, Myung G*, FitzGerald JD. “Treatment approaches and adherence with urate lowering therapy for patients with gout.” Patient Preference and Adherence. 2017 Apr 19; 11:795-800. Newberry SJ, FitzGerald J, Maglione MA, O'Hanlon CE, Han D, Booth M, Motala A, Tariq A, Dudley W, Shanman R, Shekelle PG. Diagnosis of Gout [Internet]. Rockville (MD): Agency for Healthcare Research and Quality (US); 2016 Feb. PMID: 26985540. Shekelle PG, FitzGerald J, Newberry SJ, Motala A, O'Hanlon CE, Okunogbe A, Tariq A, Han D, Dudley W, Shanman R, Booth M. Management of Gout [Internet]. Rockville (MD): Agency for Healthcare Research and Quality (US); 2016 Mar. PMID: 27099892. FitzGerald JD, Orav EJ, Lee TH, Marcantonio ER, Poss R, Goldman L, Mangione CM. "Patient Quality of Life during the 12-months following Total Joint Replacement Surgery." Arthritis Rheum 2004; 41: 100-109. FitzGerald JD, Mangione C, Boscardin W, Kominski G, Hahn B, Ettner S. "Impact of changes in Medicare Home Health reimbursement on month-to-month Home Health utilization between 1996 and 2001 for a national sample of patients undergoing orthopedic procedures" Med Care. 2006 Sep;44(9):870-878. FitzGerald JD, Boscardin W, Hahn B, Ettner S. "Impact of the Medicare Short Stay Transfer Policy on Patients Undergoing Major Orthopedic Surgery." Health Serv Res 2007 Feb:42(1p1): 25-46. FitzGerald JD, Boscardin WJ, Ettner SL. "Changes in regional variation of Medicare Home Health care utilization and service mix for patients undergoing major orthopedic procedures in response to changes in reimbursement policy." Health Serv Res. 2009 Aug;44(4):1232-52. FitzGerald JD, Weng H, Soohoo N, Ettner SL. "Regional Variation in Acute Care Length of Stay After Total Joint Replacement Surgery and Hip Fracture Surgery" J Hosp Admin. 2013 Jun;2(4):71-81 PMCID: PMC3869384. AIUM Practice Guideline for the Performance of Selected Ultrasound-Guided Procedures. Chapter lead author: Joint Aspirations and Injections. AIUM Practice Guideline for the Performance of Selected Ultrasound-Guided Procedures. Chapter co-author: Tendon, Ligament and Muscle Procedures.